" It was brilliant & the ROCKUP team friendly & enthusiastic" ... Debbie Howse, Bunnings Warehouse.
" Another great time had, on time, well organised, firm but fair and great to have prizes at the end" ... Edwin Smith Berkley Middle School.
" On time, very professional, excellent friendly staff & great with kids" ...Jolene West, Manukau Libraries. Complete with a HUGE range of exciting FUN Adventure Activities with professional friendly staff who interact with Children & Adults alike! ROCKUP is all about making a difference by raising self esteem, promoting health & positive attitudes. Bringing together communities, families, schools & businesses. 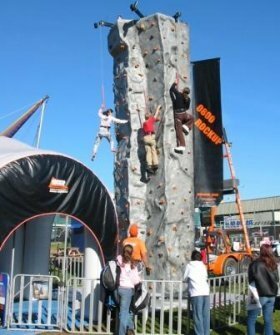 ROCKUP Climbing Walls & FUN Activities are great for community events, Galas, Expos, Promotions, Themed Parties, Top Team Days, Conference Energisers & Team Building. Put the "WOW" factor into your next school EOTC curriculum's, Camps & Family FUN Days. CONQUER your FEARS - ROCKUP & CLIMB ON! Auto Belays - Better, safer FUN! ROCKUP delivers quality climbing walls & equipment with full OSH Policies NZ wide. Awarded the NZ Design Mark for excellence in safety systems & equipment.